Kolkata serves food with a slice of history, a pinch of tradition and a garnish of culture. There are some excellent Bengali cuisine restaurants in Kolkata, where you can enjoy authentic and delicious Bengali food. 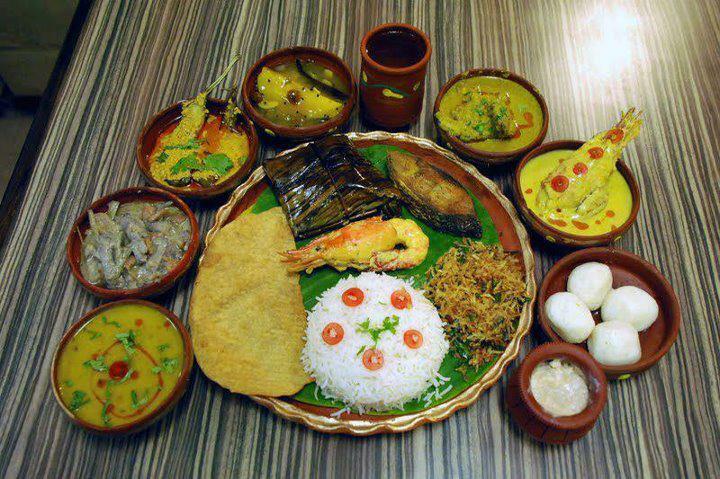 Bengali cuisine is known for its subtle flavours, and its spread of confectioneries and desserts. Fish, vegetables and lentils are served with rice as a staple diet. A hit in Kolkata, many of the following restaurants have gone on to open branches all over India. Oh! Calcutta is an ode, a celebration to the romantic city of Calcutta. The restaurant manages to lure in Bengalis, thanks to its legendary BhapaHilsa (steamed hilsa), Smoked Bhetki (smoked barramundi), Ilish Tel Jhol (hilsa poached in mustard oil) and Mutton Rezzala (fragrant mutton in yogurt based stew with poppy seed and cashew nut paste), while the non-Bengalis finally get a taste of the legendary Bengali cuisine. Apart from traditional Bengali cuisine and the lost culinary delights served only in the old Calcutta clubs, this restaurant also servesNawabi and the colonial cuisine, which left the Indian shores with the British.This award-winning, fine dining restaurant has outlets in Mumbai, Delhi, Hyderabad, Bengaluru, Gurgaon and of course in Kolkata. Established in 2003, 6 Ballygunge Place is a Bengali restaurant chain withits main branch located at Ballygunge, South Kolkata. It has branches in Bengaluru and Guwahati. Decorated with haath-pakha (hand-held fans of the Indian subcontinent) décor, it has the elegance of a Durga puja pandal (a decorated hall during the Durga Puja celebrations) or a setting for a period film. Its dishes were developed from scouring renowned cookbooks, including those containing traditional recipes from Rabindranath Tagore’s family.BhunaChingri(prawns without the sweetness of a malaikari), Ilish Begun Roll (hilsa in light gravy with eggplants) and Paan Masala (betel leaf served with a mixture of nuts, seeds, herbs, and spices) are some of the legendary dishes of this famous restaurant. Bhojohori Manna, named after the famous Bengali song “Ami Sri SriBhojohori Manna” rendered by Manna Dey in the 70’s, is a family of restaurants with a difference. It opened its doors in 2003 with the endeavour to promote the charming old world concept of a “price hotel”; it serves a delightful variety of Bengali cuisine. The menu is handwritten every day on a whiteboard and are designed keeping in mind the season, the weather, the festivities and of course the raw material available on that given day. Preparations like DaabChingri (prawn in tender green coconut), Jumbo Ilish(giant hilsa), Potoler Dolma (stuffed pointed gourd with prawn or chicken), Mochar Chop (banana flower fritters), NalenGurer Ice Cream (ice cream flavoured with date palm jaggery) and AamDoi (sweet mango yogurt) have become quite popular over the years. Bhojohori Manna outlets – now thriving in Kolkata, Siliguri, Mumbai, Bengaluru and Puri – provide its patrons with the favourite foods of Uttam Kumar through Supriya Devi to further develop the nostalgic effects of Bengali food. Bijoli Grill has something to offer for everybody’s palate and boasts a vast traditional menu. DebuBarick started from a small eatery behind Bijoli Cinema in South Kolkata around 50 years ago. It was called Dipti Cabinthen. Barick renamed it to Bijoli Grill in 1947 when he was around 23 years old. Bijoli Grill has become a formidable brand in food and catering in Kolkata. Bijoli Grill has several outlets in Kolkata, Delhi and Mumbai. The signature dishes of this eatery are Fish Orley, MocharGhanto(Bengali preparation of the banana flower), BhetkiPaturi (barramundi wrapped in banana leaf or bottle gourd leaf) and IlishBhapa(steamed hilsa). Located in the New Market area and serving authentic Dhakai Bangladeshi cuisine, the award-winning Kasturi is an inexpensive but delicious option. Established in 1994, the restaurant pioneered this type of cuisine in Kolkata. The signature dish not to give a miss is KochuBhapaChingri (steamed prawns with taro root). There is no stopping a gourmand, despite having Bengali food at home, to head to his favourite Bengali restaurant and enjoy the maach(fish), mishti (sweets) and more.